Not interested in receiving this newsletter anymore? Unsubscribe. Orthologix brings you quarterly information to keep you current on industry news, trends and insights. Orthologix is an orthotics and prosthetics practice delivering evidence-based care throughout the Delaware Valley. Pediatric gait poses special challenges due to the dynamic muscle tone that often presents in much of this population. Not only are there the usual ground reaction forces involved in gait biomechanics, but also top-down spasticity driven forces exacerbate gait deviations and deformities. Now, KiddieGAIT offers innovative options that have never been available for AFO management of these challenges. Functional environments can be created that supplement gait function instead of immobilizing and inhibiting that function. Documentation of pediatric partial foot amputation (PFA), prosthetic intervention, and effectiveness of treatment is insufficient. However, recommendations regarding pediatric prosthetic intervention advise downsizing, sequenced complexity, and a modular design that does not interfere with an increased activity level.2 In the general population, PFA is the most common amputation surgery with 2/1000 affected. 4 Transmetatarsal or mid-tarsal amputations account for approximately 24% of PFAs.3 In the pediatric population 40% of amputations are attributed to trauma.8 Lawn mowers and household accidents account for the majority of the partial foot amputations in the pediatric population.8 Current pediatric treatment options mimic those for adults with the extent of the intervention proportional to the extent of tissue lost.3 More recently, it has been recommended that any amputation involving the metatarsal heads or proximal structures requires a prosthetic intervention that extends proximal to the ankle.6 A prosthesis utilizing a custom fit rigid dynamic carbon composite (DCC) ankle foot orthosis structure to aid in the restoration of gait has been proposed for the adult PFA patient.7 By extending above the ankle, the prosthesis aids in the progression of the center of pressure along the foot and restores the biomechanics of walking. A prosthetic design for treating the pediatric partial foot amputee that restores gait function by addressing the biomechanical deficits is proposed. A custom fit rigid DCC with carbon anterior shell AFO customized with a toe-filler type socket with wedging, lifts and posting are the components of the proposed prosthesis. Until recently there was not a custom fit option for providing a reliable custom fit rigid DCC structure in which to fabricate a custom prosthesis for the pediatric population. The new custom fit rigid DCC is a prefabricated full carbon foot plate, rigid lateral strut and carbon composite anterior shell. The footplate is rigid with a tapered rocker built into the distal section with a flexible posterior section and a rigid stable midfoot. This design aids in restoring gait by allowing for a controlled plantarflexion moment at initial contact, a stable midstance and a controlled tibial advancement through terminal stance, while maintaining a 3rd rocker rollover and providing propulsion at terminal stance. This system is combined with a custom molded toe filler type prosthesis that is aligned with wedges, posts and lifts to maximize functional outcomes. This system addresses the biomechanical deficits of the PFA and the DCC is designed to have varying degrees dynamic function by style and size. The ability to customize the socket, alignment and interface helps to protect the skin of the residuum while the dynamic function can be customized for functional needs. VA is a 6.8 year old female, 42" tall and weighing 45 lb with congenital longitudinal amputations of both distal lower and upper extremities and no other co-morbidities or congenital malformations. Her intact lower extremity residual limbs are formed by the calcaneus, talus, cuboid, 4th and 5th metatarsals and the 5th phalanges with a nub distally – her lower limbs appear to be symmetrical in appearance. 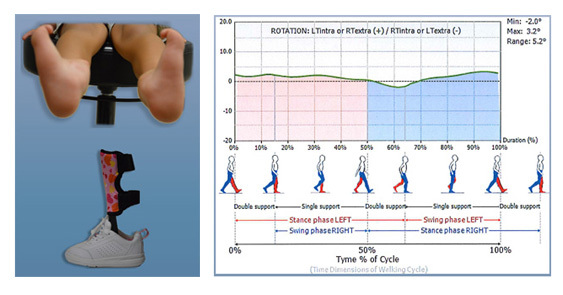 Dorsiflexion MMT strength test 5/5 bilaterally. Plantarflexion MMT strength 3/5 bilaterally with the patient able to rise onto the residual lateral toes. She does not normally wear any orthosis or toe filler but uses a high top athletic type shoe to help contain and reduce skin irritation on the medial aspect of her ankle which is the very prominent aspect of the medial talus. It is recognized that her normal ambulatory status is without orthotic/prosthetic intervention and that the tested interventions of an anterior shell dynamic carbon composite AFO (AKA: KiddieROCKERTM) with an incorporated custom ToeFiller socket and a ToeFiller alone were a new condition for the test subject and she did not have an opportunity beyond walking in the office to accommodate to the introduced interventions. However, we found that she was able to accommodate between each test intervention and ambulate without difficulty. 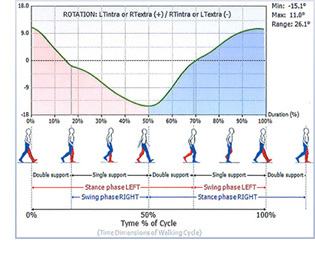 BTS G-WALK gait analysis system to measure temporal- spatial aspects of gait and pelvic girdle angles. We compared data collected with the 2 orthotic/prosthetic interventions to data collected with the subject wearing her high top shoes. Research on specific effects on gait function utilizing the proposed PFA DCC design need to be conducted. Preliminary data regarding use of the DCC AFO in the pediatric population indicates that a dynamic response carbon AFO, similar to the rigid DCC design, provides improved function in running, jumping and walking performance while Gross Motor Function Measure was also improved. 1 Similar outcomes are expected with a PFA DCC prosthesis due to the similarity of the gross structure and function of the rigid DCC design. The pediatric prosthetic design is proposed based on the outcomes of the adult treatment option with similar outcomes expected. This prosthetic design has been used with adult PFA patients since 2010 the anecdotal results are positive. Patients report increased mobility and decreased skin breakdown. 1. Bapty, E et al. CAPO. Victoria, BC Canada, 2012. 2. Cummings, DR & Kapp, SL. JPO; V4, N4, 196, 1992. 3. Dillon, M. O&P Edge; February 2010. 4. Dillon MP et al. Int'l Encyclopedia of Rehabilitation, 2013. 5. Dillon, MP. Lower Extremity Review; Feb 2010. 6. Fatone, S. O&P Business News; April 2011. 7. Kennedy, S & Meier, R. The O&P Edge; January 2011. 8. Tooms, RE. Atlas of Limb Prosthetics , chapter 32, 2002. Frank Braatz is a specialist in orthopedics and trauma surgery, physical and rehabilitative medicine and performs the additional designation pediatric orthopedics. He is a professor at the Private University of Applied Sciences (PFH, Gottingen, Germany), specializing in orthobionics and is a specialist in physical and rehabilitative medicine at the University Hospital in Heidelberg. Prior to joining PFH, he was the hospital's Chief of Technical Orthopaedics and Infantile Cerebral Palsy in the Clinic for Orthopaedics and Trauma Surgery. His orthobionics and research priorities include technical orthopedics and neuro-orthopedics, orthobionics, gait and motion analysis, and patient care in orthopedic technology. He has more than 150 scientific presentations and chairs and more than 40 publications. 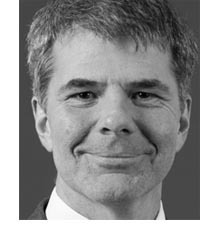 He also is a founding board member of the Association for Technical Orthopaedics, a member of the advisory board of the German Association of Orthopedic Technology (BIV), and the German Society for Motion Analysis. After training at the physical therapy school of BG Trauma Clinic Tubingen in 1989 he received his degree in medicine 1995. After stints at the BG Trauma Center Ludwigshafen, Clinic for General and Visceral Surgery at Jena (Germany) University Hospital, and the Department of Orthopaedics, University of Cologne, he joined the University Hospital Heidelberg, where he earned a specialist in orthopedics. President Obama signed the Health Information Technology for Economic and Clinical Health Act (HITECH Act) into law on Feb. 17, 2009. The HITECH Act contained health information technology provisions and also made significant changes to the privacy and security requirements of the Health Insurance Portability and Accountability Act of 1996 (HIPAA Privacy and Security Rules). The general effective date was Feb. 17, 2010, but some provisions had varying effective dates. On Jan. 25, 2013, the Department of Health and Human Services (HHS) issued a final rule that revises the standard for determining whether a security breach involving protected health information (PHI) has occurred. That rule became effective Sept. 23, 2013. Individuals must be notified (first class mail or email if electronic communication is preferred by the individual) no later than 60 days after discovery of the breach. The Covered Entity (a health plan, health care clearing house, or health care provider who transmits any health information in electronic form in connection with a transaction) must also provide notice to "prominent media outlets" if the breach affects more than 500 individuals in a state or jurisdiction. Covered entities must notify HHS of all breaches – immediately for breaches involving more than 500 individuals and annually for all other breaches. A description of the breach, including the date of the breach and date of discovery. The type of PHI involved such as full name, SSN, DOB, home address or account number. Steps individuals should take to protect themselves from potential harm resulting from the breach. Steps the Covered Entity is taking to investigate the breach, mitigate losses and protect against future breaches. Contact procedures for individuals to ask questions or receive additional information, including a toll-free telephone number, email address, website or postal address. In addition, the 2013 final HIPAA rule expands the definition of Business Associate to generally include all entities that create, receive, maintain or transmit PHI on behalf of a covered entity, including subcontractors. Under this final rule, the Business Associate that contracts with this subcontractor, and not the Covered Entity, is required to enter into a Business Associate Agreement with the subcontractor. Under the final rule, a Covered Entity must obtain satisfactory assurances (through a Business Associate Agreement) from its Business Associates that they will appropriately safeguard PHIs. Business Associates must do the same with regard to their subcontractors and so on, no matter how far "downstream" the information flows. This brief should not be construed as legal advice. Questions about HITECH should be directed to your legal counsel. Please feel free to submit your questions on the Allard's KiddieGAIT™ Orthosis as well as any other issue you would like addressed. Orthologix is available to present educational workshops and inservices for your group or your facility. Email us at info@orthologix.com to schedule. We hope you have found this issue of the Orthologix E-news informative.